The following graph shows the maximum number of net jobs lost after the end of several official recessions (both in numbers and as a percent of peak employment prior to the start of the recession). Note: The last two columns assume the 2007 recession officially ended in June 2009 or in July 2009. Recessions are labled by starting year. Even if the economy started adding jobs in November (very unlikely), the 2009 recovery would already be one of weakest for job creation. The recovery following the 2001 recession was the worst for job creation, with the bottom for employment happening in August 2003, twenty one months after the official end of the recession. 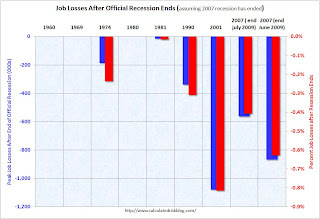 This graph shows the job losses from the start of the employment recession, in percentage terms. Look at the brown line for the 2001 recession. According to NBER, the 2001 recession lasted 8 months, but the job losses continued for another 21 months (the brown line bottoms in month 29) - and employment didn't reach the pre-recession level for 46 months. 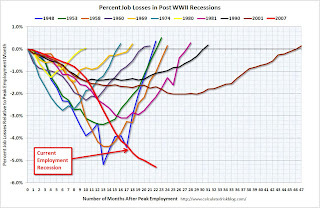 In terms of jobs lost, the 2009 "recovery" might be even worse than the 2001 recovery. Maybe we should call this a "job loss" recovery?